The infection is critical. Victory is imminent with the Pyramid Pathogen Plague. The Pathogen Plague has developed a resistance and continues to thrive in super-low oil conditions with the all-new GPS Navigational Urethane coverstock. This adaptation to hostile lane environments ensures that this epidemic has reached critical stages in high scores. The New Era 139 core powers this new motion. The core's medium RG and differential numbers, paired with the Breach Urethane coverstock allow for efficient operation and controlled motion even through the driest of lane conditons. Resilience is the key to success with the Pathogen Plague. 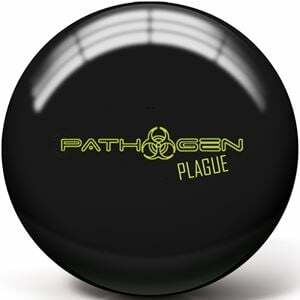 Lighter colored urethane swirls are common on the Pathogen Plague. This is a product of the manufacturing process and doesn't affect ball reaction in any way.